Almost everything is possible here, as long as you're not hurting or offending anyone on purpose! Everyone trying to advertise or promote websites, articles or whatever will be deleted and banned immediatly. Go and promote your stuff at Ebay: we are not remotely interested! This is a Sean Bean board: please keep the Bean threads Bean, there are enough not Sean related threads to do as you please. 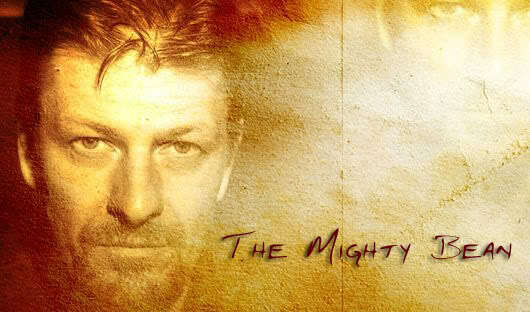 Also : we are a discussion board, so feel free to discuss, but if you only want to rant and rave on Sean, his work or his personal life please go elsewhere : this is a forum for people who like Sean Bean ! We acknowledge the fact that Sean Bean has a private life, where he has the right to make his own choices for who he likes and loves, it's no business of ours. His children and girlfriends/wives are no celebs and are entitled to living their own lives, so please don't involve them in Fan Fiction or gossip here. Before you can enter the 18+ you'll have to be 18 year or older and must have made 50 serious posts, so we know we can trust you. When you made 50 posts, pm me and I'll let you know as soon as possible. Due to non members hotlinking to other sites I had to make some of the topics here for registered people only. We can't have people using our paid bandwidth! So you'll have to register, and introduce yourself in the Welcome and Introduction thread to be able to look at the Picture gallery or Multimedia for instance. Sorry about that! Every new member has to post on a normal, regular bases. When people subscribe and don't post seriously they will be deleted without hesitation. Of course when people notify me, Moominmamma, Terry or Macpy (moderators) and have a good reason like holidays or other matters, that's no problem. Same exception goes for people we know. Have fun: I am sure you'll like it here! And must I always notify that I on my holidays? Seriously is more than giving a smilie as comment on just a few posts until you get to 50. That doesn't work. Of course you don't have to notify when you're in holiday, but when someone doesn't post in 6 months I kinda think she's no longer interested. Last edited by Govi on Mon Aug 25, 2008 8:35 am, edited 1 time in total. Thanks for explanation. You always kind and have great patience. Hi, I'm new and a little lost as the begginer I am... I have a question about the biography section... When is people allowed to have a look? You must post a certain number of times?? Ask for permission? Just curious! I just have to know you a bit better Rita. I know now you want to read it, I'll let you know when yoiu have access. I have to know I can trust people, as I don't want to risk anything. Very wise, Govi, thank you for protecting Sean an our dream! Ok! Thank you very much for the explanation! I am Spanish, and do not understand English well, I hope to keep up forum. Thank you for a set of very sensible rules. This site is of interest to me because the tone is sober and the information is trustworthy. There you are. I will repost this at the Welcome section and open up the galleries for you!